All Chemical Spills vary from quantity area involved, substance in use and number of staff exposed. Importantly is to have a plan in place that has been practiced and tested and more importantly that all staff are properly trained to take action with the appropriate equipment on site. The safety Health and Welfare at Work Act 2005 states that where hazards and risks are involved that an action emergency plan must be in place. 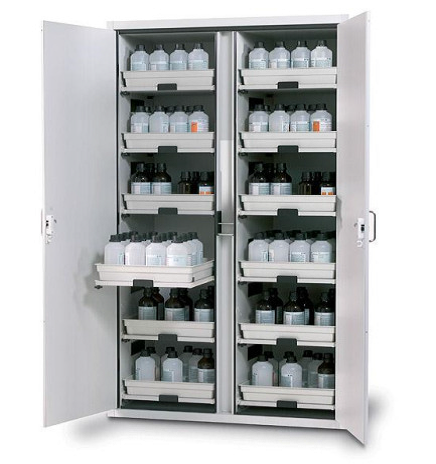 Chemstore offer this extensive tried and trusted training. 1) Have a laboratory site map on location showing access and egress routes, chemical storage cabinets, lab work stations and in addition the location clearly marked showing shower and eye wash station units, fire extinguishing and chemical first aid kits and spill kits. Vitally important is a complete record of safety data sheets (SDS) of all chemicals on site including quantities. Always ensure that the appropriate PPE is available on site. 2) Know the hazards, all staff must be fully aware with safety data sheet contents at all times ensuring correct action. 3) Write down spill response procedure and place in strategic positions with laboratory, again Chemstore offer the full correct training. 9) Aftermath, Investigate the accident incident in detail to ensure prevention in the future and to improve the plans for response in place, this aspect should involve all staff and the use of a competent chemical safety company, Chemstore can train your company in all these aspects.